The mission of the Brent Woodall Foundation’s Preschool Readiness Education Program (PREP) is to provide students in the Dallas- Fort Worth Metroplex with academic and social skills practice in a classroom setting. Using the principles of Applied Behavior Analysis, PREP prepares students to integrate into a typical preschool or kindergarten setting. 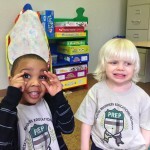 PREP is open to all children ages 3-5 including those with autism, developmental delays, or language delays. The school year includes two twelve-week-long semesters and runs Monday through Friday from 9:00 am- 2:00 pm. A typical day at PREP will include a welcome and planning time, learning through movement, a themed language lesson, learning centers (fine motor and handwriting, computers, sensory, games, reading, math, and dramatic play), social lunch, and circle time. Each semester will include various electives such as art, music, yoga, French, Spanish, and Sign Language. PREP adheres to any toilet training programs and behavior plans necessary for each student. PREP has a 1:3:10 teacher/prompter/student ratio. If necessary, 1:1 prompting will be provided for children who require additional support. Jaci Hardwick is the Assistant Educational Director for the Brent Woodall Foundation for Exceptional Children and is the lead PREP teacher. She is a certified teacher and has several years of experience teaching children with autism and other developmental disabilities. PREP is taught at the Brent Woodall Foundation’s therapeutic center in Irving, Texas. Download the PREP Application HERE! Return your completed application to the Brent Woodall Foundation by 9/3/ 2015.